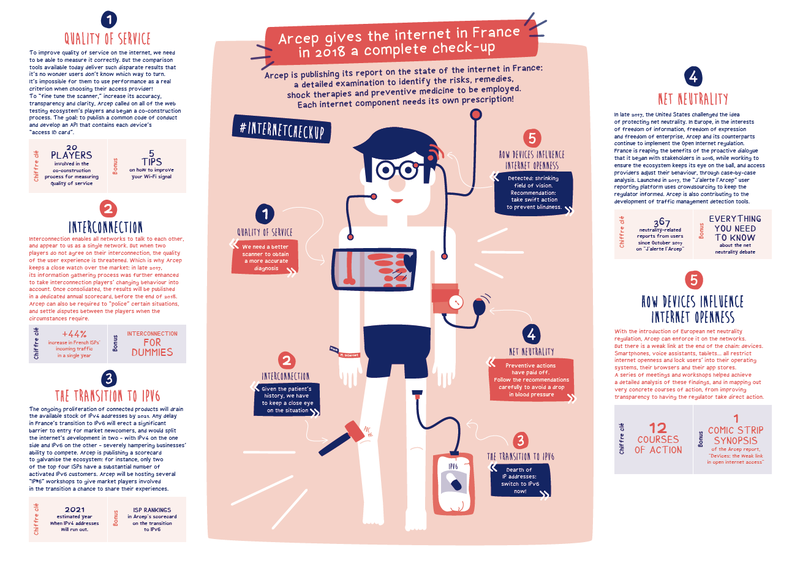 For the second year in a row, Arcep is publishing its report on the "state of the internet in France". Submitted to Parliament, this report focuses on the different components of fixed and mobile internet networks: quality of service, interconnection, the transition to IPv6, net neutrality and the openness of devices are all put under the microscope. Based on the idea of "a complete check-up," Arcep delivers a "diagnosis" of the year gone by, and identifies the "shock therapies" or "preventive medicine" that need to be employed. The goal: to ensure that the network of networks that is the internet remains an inclusive public resource. Arcep's teams will be presenting the findings of this work to the press and market experts, in the form of a health check-up, with special guest, Sophie Beaudouin-Hubière, Deputy and Vice-president of the National Assembly's Economic Affairs Committee. After the presentation, the teams will be available to answer any technical questions or questions about their working methods.